For our first night in Dublin, this was a great way to ease in. It's a tourist activity but fun nontheless, food was better than I expected, entertainment was FANTASTIC, impressive. Irish hospitality cant be beat and that was true of everywhere we went in the country. Was hoping for a taste of traditional music and dance and this show delivered in spades. A highly enjoyable evening. This was probably the highlight of our trip to Dublin. I was expecting a second-rate, somewhat cheesy show however, the musicians and the dancers were amazing. The lead singer put so much passion into his performance. The food was also delicious - again, much better than I was expecting. I took my 3 teenage nephews aged 14-19 to the show, and they loved it too. We have appreciated our evening. It was worth every penny. The food was good and the troup of dancers were very professional. A rather small stage made my first experience to enjoy an Irish show in such an intimate atmosphere. Show was ok. Dinner was average. We had better events while in Dublin than this one. 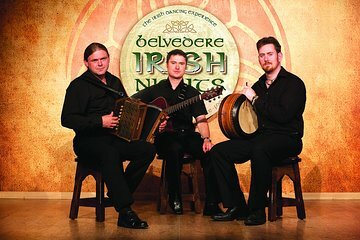 This was an amazing show and a must see to learn and appreciate the Irish culture! What fun! Great food and spectacular entertainment made for a wonderful evening. We highly recommend this activity.